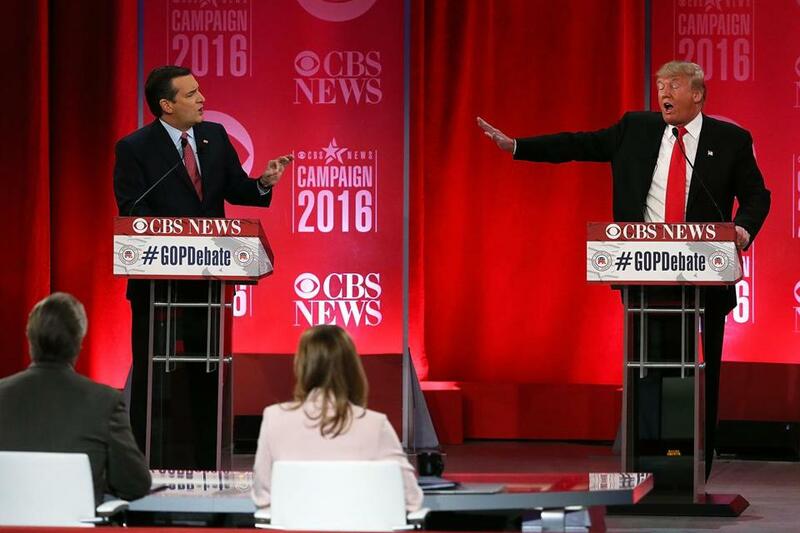 Republican presidential candidates Ted Cruz and Donald Trump participated in a debate. A new poll has found Republican Senator Ted Cruz in a statistical tie with businessman Donald Trump among Republican primary voters. The NBC/Wall Street Journal poll found Cruz with a slight edge over Trump, but within the margin of error. Cruz received 28 percent of support, and Trump had 26 percent. Marco Rubio came in third in the poll with 17 percent of support, followed by John Kasich at 11 percent, Ben Carson at 10 percent, and Jeb Bush at 4 percent. Trump has held a lead in many national polls for months, making Wednesday’s poll result a potential shake-up in the state of the GOP race for president. The poll was conducted following Trump’s decisive win in New Hampshire and Saturday’s GOP debate in South Carolina. The survey was conducted nationally among 800 registered voters and 400 GOP primary voters. The margin of error among the GOP primary voters surveyed is 4.9 percent.